The ARS Mayr Fresno Chapter was the first chapter established on the west coast in 1915. Five years prior to its establishment, back in 1910, the year that the ARS was founded, Edgar Agnouni, who brought together the women’s groups, also made a visit to Fresno, California. The first six members were the following: Serpouhi Varjabedian, Hroot Kalenian, Hajie Khas Boyadjian, Prapion Hagopian, Marian Aprahamian, and Marian Badouhasian. Ardavazt Rsdigian, a community activist, acted as an advisor to the fledgling chapter. During the first three years, 1915-1918, the chapter held 49 membership meetings, two community forums, four festivals they called “Hates Bazar”s, one Red Cross Tag Day, and one theater performance by the Toorkan Troupe. The income from the theater performance was $350.50, and was allocated to the injured Armenian soldiers and orphan survivors of the Armenian Genocide. On November 6, 1915, 61 young Armenian women and 28 local women wearing Red Cross crosses crisscrossed the downtown Fresno streets and sold tags. Late that evening, they had collected $1,210 for assistance to the Genocide refugees, which was sent by telegram to His Holiness in Echmiadzin in Armenia. The proceeds of the festivals, $729, were generated by selling needlework and clothing made by the members, who made time from their daily chores to volunteer for the ARS. The chapter collected 14 big boxes of clothing for the Armenian Genocide survivors who took refuge in the Caucasus region. Special inscribed handkerchiefs were made Armenian volunteers to the French Foreign Legion, numbering 1,000, with a red cross at one corner, and noting that it was a gift from the Fresno Chapter to the brave volunteers fighting for the liberation of the homeland. Handkerchiefs were also sent to Armenian soldiers, who were stationed at Camp Kearny and Louise. The chapter raised an additional $610 from various fundraising events and donations. During the period between 1920 and 1930, the chapter members visited the youth, who did not have any families in Fresno, and lived at a hotel, taking them gifts. In return, the youth made donations to the chapter. This effort was led by Ghougasian and Gostanian. During World War II, the chapter held dinner-dances for the Armenian and non-Armenian soldiers. During the decade of 1940 to 1950, the annual dinner-dances held by the chapter during the month of May were attended by 600 to 1,000 people. During the decade of 1950 to 1960, the membership had swelled to 200. The Mayr Chapter contributed to major ARS fundraising efforts by holding special fundraising events to help the Nshan Palanjian Jemaran in Beirut, Lebanon, and sponsored poor students attending Armenian schools in Kessab, Syria, and Greece. The ARS established an inter-chapter council, which were held in Fresno. The representatives from ARS Chapters in southern and northern California participated in these meetings. The council was eliminated, when the ARS of Western U.S.A. was established in 1984, with its own elected Regional Executive Board. In 1952, a Junior chapter was founded by the efforts of Victoria Gostanian and Nazig Gojolozian. By 1968, the juniors became a full fledged Sophia Chapter, named after Sophia Hagopian, who had led the Mayr Chapter for over 30 years. 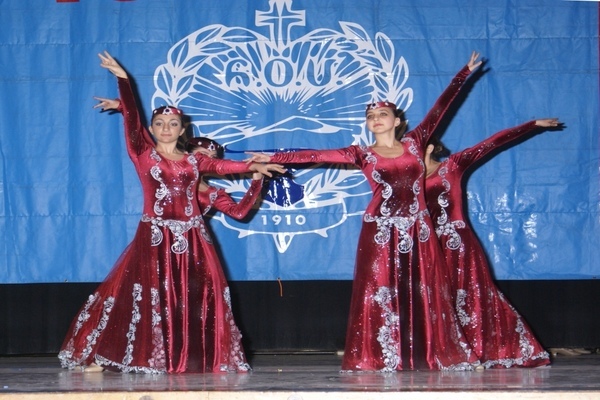 On December 4, 2005, the chapter celebrated 90 years of service at the Social Hall of the Holy Trinity Armenian Apostolic Church. The chapter continues its legacy of service to the local Fresno community, as well as supports programs in far away Armenia and Artsakh.